Before I get to Stewy I just want to show today’s wildflower find. I discovered these tiny yellowed eyed pretties with pale blue petals while walking through a corn field. I didn’t expect to find Bluets among the corn debris but there were a fair number of tight little clusters like this one. If it doesn’t rain tomorrow I’ll be going back to ‘save’ them. How can I resist? Nearly every cat I’ve had has followed me around but none like Stewy. Stewy will tag along through woods and fields on walks that loop around a couple miles out back. Stewy would rather hunt for mice along the stone walls but he’s patient enough and will wait for me when I fuss with the camera. Dog not so much, Pookey took off for home rather than wait. Dog doesn’t care to be out standing in a field. 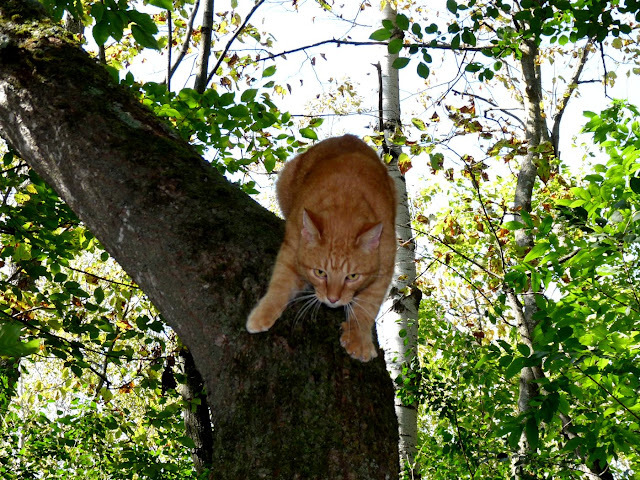 The stone walls are Stewy’s favorite hunting grounds. There are plenty of mice and chipmunks that easily evade him by vanishing into the walls but Stewy doesn’t mind, finding a comfortable place to wait for them to reemerge is no problem. 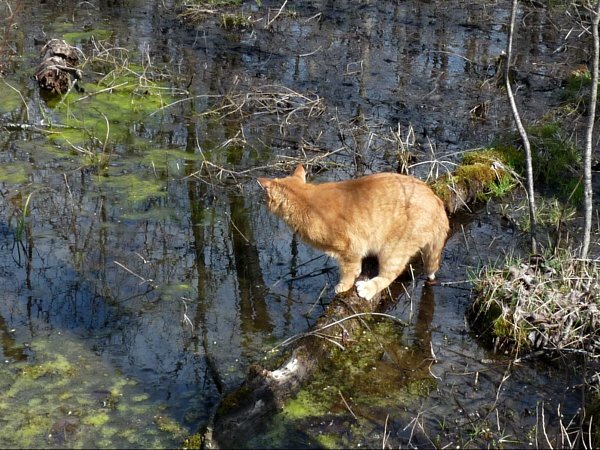 The swamp out back might slow Stewy down but it won’t stop him from following. This time I had to wait. There was a jump of about 6 feet to dry ground and Stewy had to sit and think it over. Who put my tail in the water? About now I was getting a feeling Stewy was considering me pond scum. Just as I was about to save him, Stewy made the jump. I have to admit it was an impressive leap of faith. Winter’s silence was shattered by returning geese. A cacophony of honking coming from the river can be heard a mile away. Hundreds of Canadian Geese lend their voices to the clamor and it only gets more raucous when disturbed. Most took flight after I arrived but a couple stood their ‘ground’ on the far side of the river. I spotted a pair of wood ducks perched in a tree but they took flight before I could get a photo. On the way home I managed to get a photo of a male in the swamp. Two pairs managed to swim into heavy brush before I could get more than one quick shot off. Do ducks swim or float? Stewy claims the bird bath. It seems to make a nice cozy cat sunning stone. The boulder is a work in progress. Another session with a rotary hammer drill should finish the basin. This rock is almost more than I can chew. It is much harder than I expected.